The holiday season is approaching. Perhaps it's the right time for exploration of the travel agencies websites. This is where people are looking for a perfect place for their next summer hideaway. 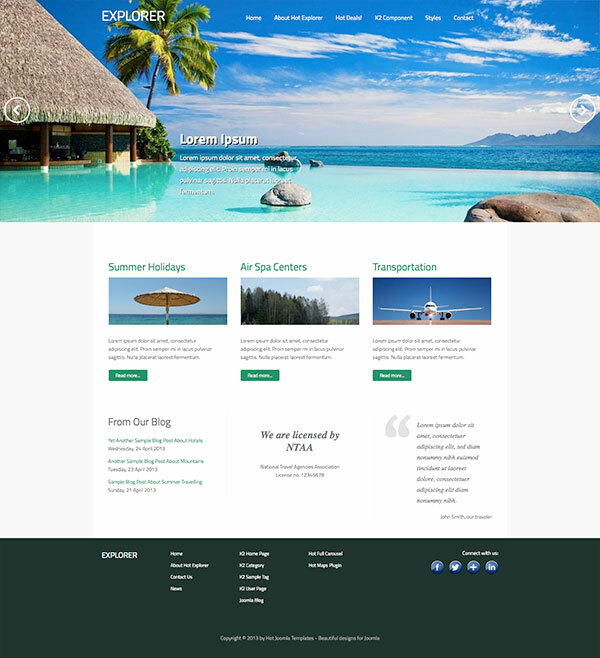 We prepared another Hot template for the websites about tourism which could help travel agencies to create a clean and usable responsive website for their business. It's based on Joomla with K2 component, but can be also used even without K2. 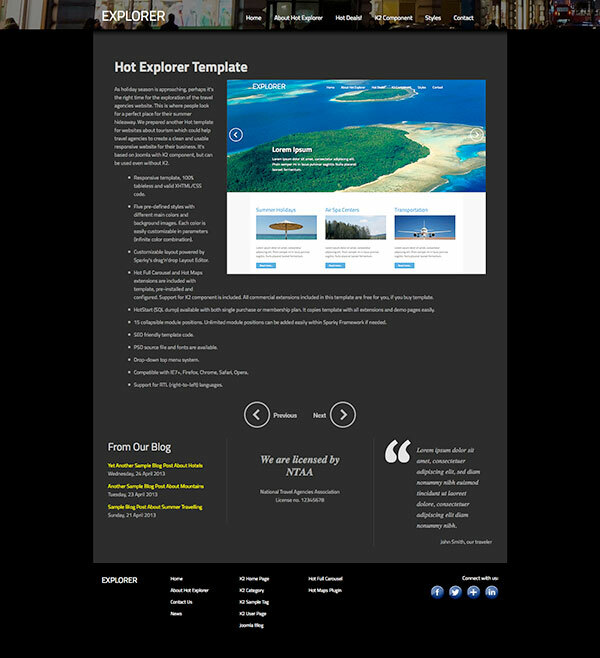 Recently released Hot Full Carousel responsive slideshow module, has found its place in Hot Explorer template. 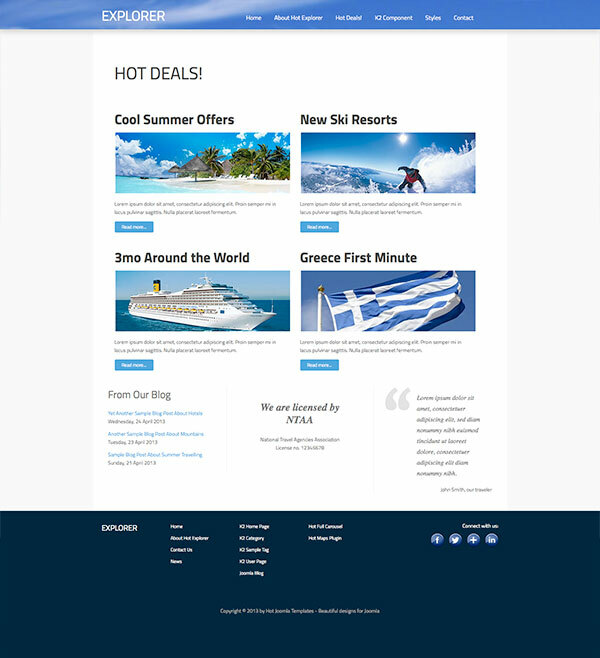 Not anywhere, but in the focus of the home page which represents the best images from the travel agency portfolio. This big area has been also covered with logo and top menu module positions. In the inner pages, there's a long thin banner. There are 5 differently styled banners for each of 5 different color variations. Another tool that we decided to include with this template is (you assumed) Google Maps module and plugin for Joomla - Hot Maps. 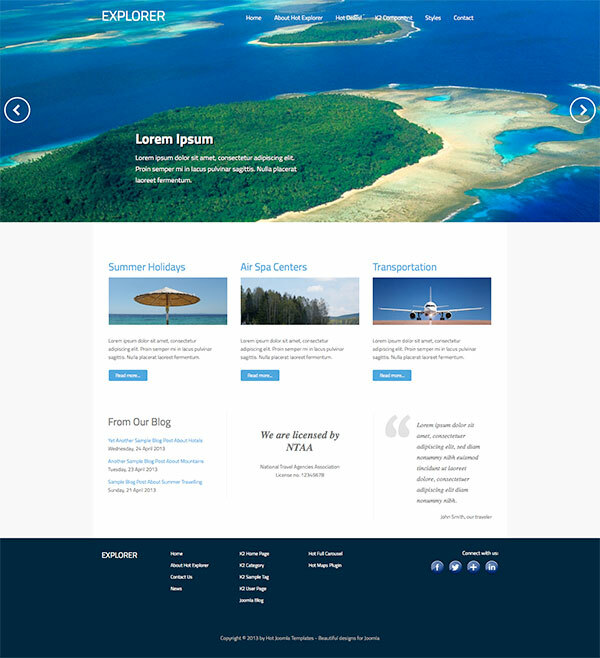 Help of this tool when developing a travel agency website could be crucial because it allows you to put an interactive map or satellite images of any place in the world that you are describing on the page. This template has been powered by the latest version of Sparky Framework which means that it contains an unbeatable collection of tools for customization of your site, from simple things as color pickers to the drag and drop layout editor which can be used for user-friendly layout modifications without coding. 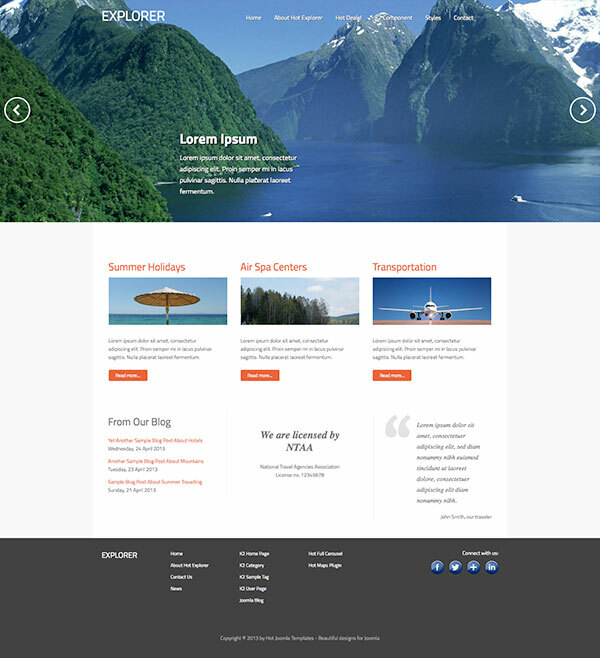 Responsive template, 100% tableless and valid XHTML/CSS code. Five pre-defined styles with different main colors and background images. Each color is easily customizable in parameters (infinite color combination). Customizable layout powered by Sparky's drag and drop Layout Editor. 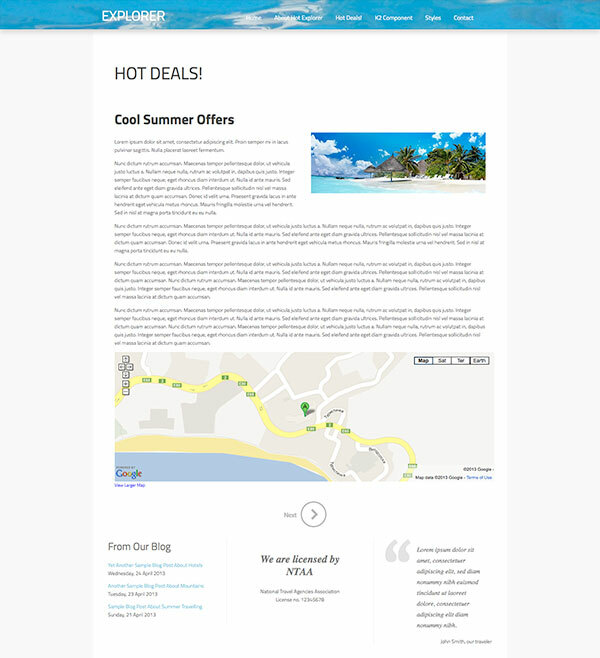 Hot Full Carousel and Hot Maps extensions are included with template, pre-installed and configured. Support for K2 component is included. All commercial extensions included in this template are free for you, if you buy template. 15 collapsible module positions. Unlimited module positions can be added easily within Sparky Framework if needed.